Model 82A with Top Rim Clamp Option for handling your rimmed 55-gallon (210 liter) plastic drum. The 4560-P Top Rim Clamp holds the drum at a fixed point under the top drum lip, and allows rotating a drum that is up to 36" tall (See: swing clearance drawing). 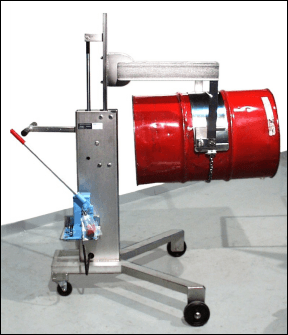 If drum is taller than 36", the bottom will hit using the 4560-P.
Model 82A with Bracket Assembly Option required for handling a rimless 55-gallon (210 liter) plastic drum, and recommended to more secure hold a fiber drum. The 4556-P Bracket holds the drum at a fixed point under the bottom of the drum. 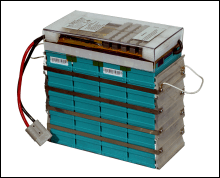 The 4556-P can be used with a drum from 31" to 39" tall. 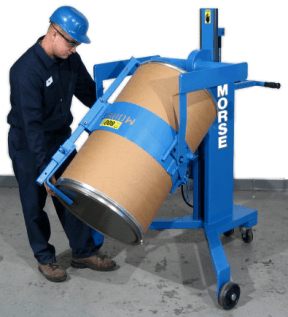 Morse Drum Palletizers allow you to move drums on and off shipping pallets, spill containment pallets, and drum dollies. The V-shaped base is designed so you can raise and place a drum at the corners of a pallet. 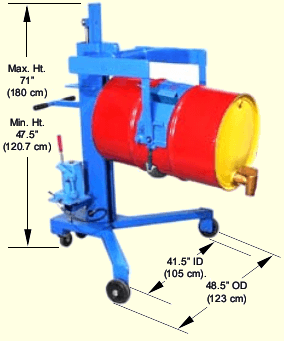 Manually tilt drum to pour at up to 26" (66 cm) high without the safety risks of manhandling heavy drums. You can rotate your drum 360 degrees end-over-end. Lock drum at horizontal to dispense, or lock drum upright to prevent spills while transporting. 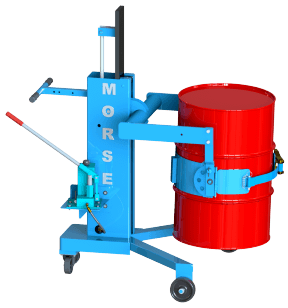 Models are available with ergonomic power-lift to raise your drum with AC, DC or Air power-lift. Lift upright drum up to 20" (50.8 cm) above floor. Effort required to tilt drum depends on several factors. A balanced 600 Lb. (272 kg) drum will pivot on the fulcrum far easier than a bottom heavy unbalanced drum of the same weight. Top Rim Clamp Option (# 4560-P) for your 55-Gallon (210 liter) Rimmed Plastic or Fiber Drum. Bracket Assembly Option (# 4556-P) for Rimless Plastic Drum, and recommended to more securely handle Fiber Drum. 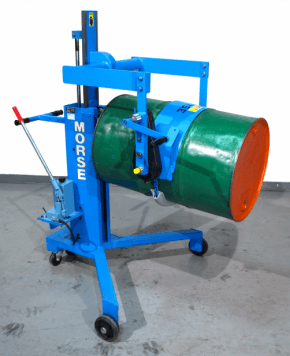 Morse drum palletizers that pour drum will straddle a pallet up to 41" (104 cm) wide and 7" (17.8 cm) tall. It is shown here spanning 36" (91.4 cm) wide pallet. Stainless steel models are available with DC, AC or air power lift. Model 82A-SS shown here has hand pump drum lift, and manual drum tilt. 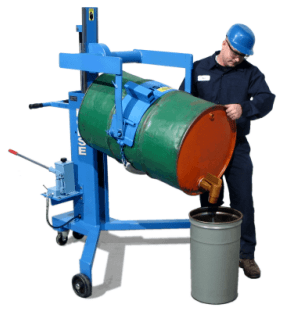 82A Drum Palletizer with Hand Pump Hydraulic Lift, Manual Drum Tilt - 504 Lb. (229 kg) L50" W50" H56"
82A-120 Drum Palletizer with 60Hz AC Power Hydraulic Lift, Manual Drum Tilt 1PH/115V/60Hz, TEFC AC Motor 525 Lb. 82A-127 Drum Palletizer with 50Hz AC Power Hydraulic Lift, Manual Drum Tilt 1-Phase 50Hz Motor 525 Lb. 82A-124 Drum Palletizer with Air Power Lift, Manual Drum Tilt Pneumatic Cylinder and Valve 525 Lb. 82A-125 Drum Palletizer with Battery Power Hydraulic Lift *, Manual Drum Tilt 12V, DC* Motor 551 Lb. (250 kg) L50" W50" H56"
82A-SS Stainless Steel Drum Palletizer with Hand Pump Hydraulic Lift, Manual Drum Tilt - 504 Lb. 82A-SS-120 Stainless Steel Drum Palletizer with AC Power Hydraulic Lift, Manual Drum Tilt 1PH/115V/60Hz, TEFC AC Motor 525 Lb. 82A-SS-124 Stainless Steel Drum Palletizer with Air Power Lift, Manual Drum Tilt Pneumatic Cylinder and Valve 525 Lb. 82A-SS-125 Stainless Steel Drum Palletizer with Battery Power Hydraulic Lift *, Manual Drum Tilt 12V, DC* Motor 551 Lb. 4560-P Top Rim Clamp for your 55-Gallon Rimmed Plastic or Fiber Drum. (5 kg) L20" W9" H17"
4556-P Bracket Assembly for Rimless Plastic Drum, and recommended to more securely handle Fiber Drum. (8 kg) L41" W15" H7"
4724-P Kit to convert 82A to 82H Drum Palletizer / Mover 35 Lb. 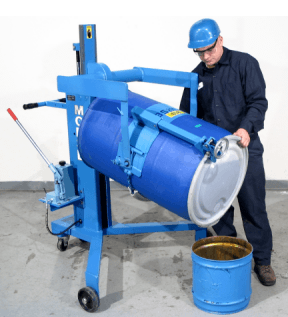 (16 kg) L29" W19" H30"
Drum Palletizers that pour. 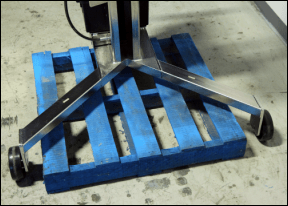 Move drums on and off spill pallets or drum dollies without the risks of manhandling. 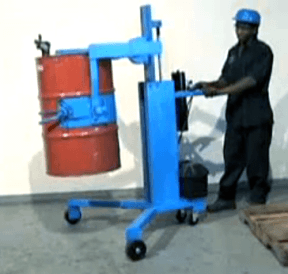 Raise drums with the ease of Power Options and move drums on and off pallets.